White-capped waves splashed along Lake Michigan’s sandy shoreline, where dozens of families played one recent afternoon in the summer sun. But just to the west, behind the bikinis, board shorts and sandcastles — next to one of Indiana’s most pristine natural landscapes — looms a smokestack, towers and girders. Here lies one of the largest steel mills in the United States — and heaps of waste that environmentalists long have considered among their most troubling concerns in Indiana. Over the course of two decades, the mill’s owners stockpiled “slag,” “blast furnace filter cake,” “basic oxygen furnace sludge,” “secondary wastewater treatment plant sludge” and “sinter plant waste” in uncovered lakeside heaps, amassing more than 3 million tons of waste. Last week, state environmental regulators, the steel mill’s owners ArcelorMittal and two environmental groups reached a settlement that will require the mill to remove or recycle the waste and also to test the soil underneath to see if it has been contaminated with toxins. But if this is a victory for environmentalists, they say the two-year legal fight that preceded it illustrates precisely what is wrong with the state agency tasked with enforcing state and federal environmental laws. Kim Ferraro, a Valparaiso-based attorney representing the Hoosier Environmental Council and Save the Dunes, believes strongly that if the legal challenge had not been filed, IDEM never would have moved to require cleanup. “I feel like I’m doing IDEM’s job sometimes,” Ferraro said. Various environmental advocacy groups consistently rank Indiana among the worst in the nation for its air and water quality. One reason why, environmentalists contend, is that far too often powerful business interests have been given a free pass to pollute. The situation at ArcelorMittal, though, is especially galling to some environmentalists. Thomas Easterly, who was appointed by Gov. Mitch Daniels to lead IDEM in 2005, previously worked for Bethlehem Steel, the mill’s pervious owners. And Easterly’s job? He was the mill’s environmental compliance chief from 1994 to 2000 — at a time when the dumpsites grew taller and larger. Some critics even refer to the large mound closest to the shore as “Easterly’s Pile.” At one point, environmentalists say, the mounds of refuse there towered as tall as 35 feet across an area that spread nearly 34 acres, almost to the water. Plus, she said, Easterly didn’t put it there. Hartsock said that dump site dates back to the 1980s, well before Easterly joined what was then Bethlehem Steel in 1994. More broadly, Hartsock said that under Easterly the agency has been a staunch enforcer of state and federal environmental laws. She said the commissioner has “accomplished a great deal.” She notes IDEM has gotten the vast majority of Indiana communities to come up with long-term plans to address sewage overflows into waterways; industrial facilities’ permits are up-to-date and up to current standards; and, for the first time, every Indiana county is meeting U.S. Clean Air Act standards. And not all environmentalists consider Easterly’s watch with utter disdain. Others in the environmentalist community say the waste piles are just one of the more glaring examples of a longstanding pattern of how Indiana’s elected leaders see environmental regulations as obstacles to business. 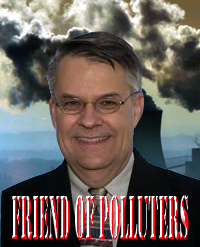 Southern Indiana environmentalist John Blair sees a flip side. More specifically, the groups criticize the agency’s enforcement wing and its “streamlined” permitting process they say allows polluters to avoid more stringent reviews. They point to Bear Run Mine, which an Indianapolis Star investigation noted in January is the only mine of its size in the U.S. that is not required to follow an individual permit, which would require more stringent standards and monitoring for pollution. Environmentalists also note the 2009 appointment of a former coal industry lobbyist and lawyer who for a time oversaw IDEM’s legal department. Easterly and Daniels “lobotomized that agency,” said Larry Davis, an ArcelorMittal electrical worker who has worked at the Burns Harbor plant for 34 years. He also is a former member of a number of environmental groups and has tried to push the plant to find ways to recycle its waste, rather than dump it. But if IDEM’s record under Daniels and Easterly is a point of contention, so, too, is the danger of those heaps that hug the shore of Lake Michigan. Ferraro cites IDEM’s own documents, which describe the materials at the dump sites as containing lead, arsenic, cadmium and other heavy metals. Hartsock counters that the U.S. Environmental Protection Agency performed tests on the sites — one of the piles as recently as 2009 — and found them to be nonhazardous. That settlement agreement could lead to a more definitive answer as to how concerned Hoosiers should be about the waste. After the legal challenge was filed, IDEM last year put in place an order that requires ArcelorMittal to guarantee the waste is recycled or removed and that runoff during the cleanup progress is controlled. But last week’s settlement takes it an important step further. Now, ArcelorMittal also must test the soil once the remaining 1.8 million pounds of sludge is removed and make sure no toxins remain. The mill’s operators declined interview requests, but in a statement, ArcelorMittal officials said the firm is “pleased to have come to an agreement with the parties on material storage” at the Burns Harbor plant. Company spokeswoman Mary Beth Holdford said in a two-paragraph email that the settlement allows ArcelorMittal to move ahead with the Deerfield Storage Facility, a 75-acre onsite landfill for some of the waste that can’t be recycled. Scrutiny over the mill’s waste first surfaced in a major way in 2009 when the Post-Tribune of Merrillville launched an investigation just as ArcelorMittal was applying to IDEM for a landfill permit to dispose of at least 1.5 million pounds of above-ground mill waste. The next year, the environmental groups filed their challenge. They alleged state and federal laws prohibit long-term dumping of solid waste, yet regulators since at least 1999 have acknowledged the mill’s operators have been dumping it in above-ground piles. Their legal filing also alleged that ArcelorMittal escaped public notification and scrutiny by filing an informal draft application for its new landfill in 2008. But mostly the filing sought to force IDEM to require ArcelorMittal to clean up the site. That it came to that — multiple complaints from the public and a legal filing– to push IDEM to start forcing polluters to clean up their act, Ferraro said, is a longstanding source of frustration. But Hartsock, the IDEM spokeswoman, said it shows the process worked. Complaints from the public, she said, are often how IDEM learns of and addresses problems. Though, in the case of the mounds of waste on the Lake Michigan shore — one, fairly or not, labeled “Easterly’s Pile” — environmentalists say that’s not exactly something the public needed to bring to the agency’s attention. Follow Star reporter Ryan Sabalow on Twitter at twitter.com/RyanSabalow. Call him at (317) 444-6179. This entry was posted in Uncategorized and tagged ArceolorMittal, Easterly's Pile, IDEM, Indiana, Mitch Daniels, pollution. Bookmark the permalink.